This piece was created over a period of time. 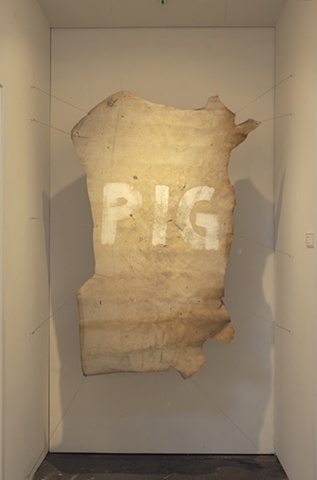 The hide was stretched upon a wall in my studio and I painted PIG onto it using acrylic paint. Over the next few months I hit it several times a day with various implements (whips, belts & nail-spiked wood) and urinated on it weekly causing the word to fade and the hide to deteriorate through the abuse.